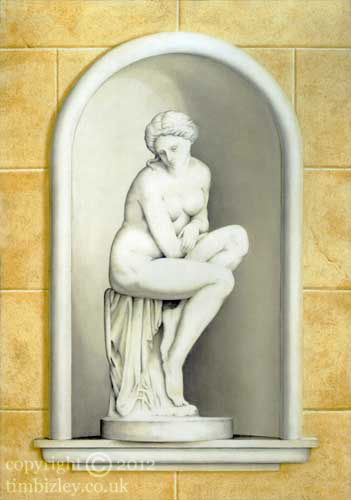 This illusionistic painting of a Carrara marble statue currently displays in New Orleans. The work is executed in transparent oil glazes on a white ground and is undertaken using a method akin to water colour painting. That is; it is worked light to dark, the highlights being reserved from the start and no white pigments used in the painting process. The terms illusionistic art and trompe- l'oeil are to some degree coextensive. Often this technique is employed in murals, where a large expanse of ashlar stone work is broken up with niches containing various elements that one might find in a real setting: statues, antique objects, vases of flowers etc.